Especially if you have been together several years or more and have begun to purchase property jointly (a new bed, for example), you may want to do what a fair number of unmarried couples do—abandon your agreement (if any) to keep property separate, and instead treat property that either of you purchases as jointly owned. If this is your understanding, write it down. Use the sample Agreement to Share Property form included here as model in preparing your own. This agreement establishes that all newly acquired property—except that given to or inherited by one partner, or that which is clearly specified in writing as separate property—is to be jointly owned by both, and equally divided should you separate. Note that Clause 3 of this sample agreement assumes that you will attach a list of the property each of you owned prior to the date of your agreement. (See the sample Separately Owned Property form included here--this will be Attachment A of your agreement.) Clause 3 also assumes you will attach a list of jointly owned property. 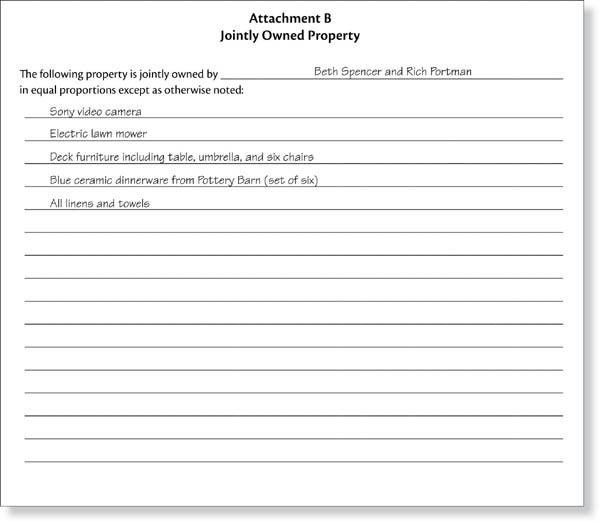 (See the sample Jointly Owned Property form included here--this will be Attachment B of your agreement.) You may be as detailed as you want in preparing these separate property lists, but at least include major items (valued at $100 or more). Be sure to update your lists from time to time—either when you make a major purchase or at least once a year. You will want separate agreements if you want to buy a car together or buy a house together. See our tips for writing a living together agreement before preparing your own property agreement. While you can use the sample Agreement to Share Property form included here, make sure it fits your particular situation--and that you edit, delete. and adding clauses as appropriate. Make a two copies of the final draft (including all attachments) so you and your partner each have a copy. Keep your copy in a safe place, along with copies of other important documents, such as insurance papers, title slips to jointly held property, lease, copies of wills, important financial papers, and the like. Notarization is optional. Usually, having your agreement notarized isn’t necessary. However, in some states you must notarize the agreement if it covers issues affecting real estate. If that is the case, sign the agreement before a notary. Then if you wish, you can record the agreement at your county records office. Notarization doesn’t make a contract legal or enforceable. It simply proves that your signatures aren’t forged, which can never hurt. 1. This contract sets forth our rights and obligations toward each other. We intend to abide by this agreement in a spirit of cooperation and good faith. 3. All real or personal property earned or accumulated by either of us prior to the date of this agreement (except jointly owned property listed in Attachment B of this agreement), including all future income this property produces, is the separate property of the person who earned or accumulated it and cannot be transferred to the other except in writing. Attached to this agreement in the form of Attachments A, Separately Owned Property, and B, Jointly Owned Property, are lists of the major items of property each of us owns separately and both of us own jointly as of the date of this agreement. 4. Should either of us receive real or personal property by gift or inheritance, that property, including all future income it produces, belongs absolutely to the person receiving the gift or inheritance and cannot be transferred to the other except in writing. 5. In the event we separate, all jointly owned property will be divided equally. 6. Any dispute arising out of this contract will be mediated by a third person mutually acceptable to both of us. The mediator’s role will be to help us arrive at a solution, not to impose one on us. If good faith efforts to arrive at our own solution to all issues in dispute with the help of a mediator prove to be fruitless, either of us may make a written request to the other that the dispute be arbitrated. In that case, our dispute will be submitted to arbitration under the rules of the American Arbitration Association, and one arbitrator will hear our dispute. The decision of the arbitrator will be binding on us and shall be enforceable in any court that has jurisdiction over the controversy. By agreeing to arbitration, we each agree to give up the right to a jury trial. 7. This agreement represents our complete understanding regarding our living together and replaces any and all prior agreements, written or oral. It can be amended, but only in writing, and any amendments must be signed by both of us. 8. If a court finds any portion of this contract to be illegal or otherwise unenforceable, the remainder of the contract is still in full force and effect.